Place all of the cheese ball ingredients in a bowl and mix to combine well. Using a small ice cream scoop / cookie dough scooper spoon, portion out the cheese mix and make 1 inch balls. Place the balls on a baking tray. Put the baking tray in the freezer for about 15 minutes until they are firm. While the cheese balls are in the freezer prepare the dredging station. In one bowl add the flour, garlic powder, cayenne, and onion powder, mix to combine. Place the Panko crumbs in a third bowl. Place the chilled cheese balls in the spiced flour mix. Now coat with eggs, followed by the flour again, and the egg mix again. Finally coat the cheese balls with the panko crumbs and set aside on the baking tray again. Place the cheese bites in a single layer. You may need to cook in batches. 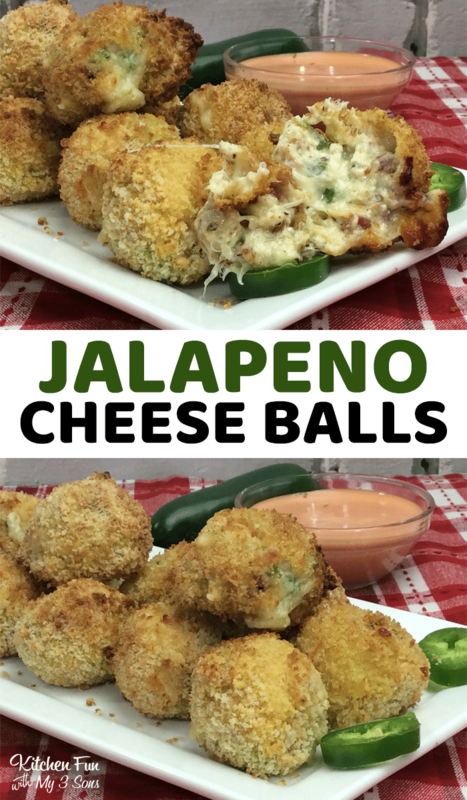 Remove the cheese balls from the Air fryer.